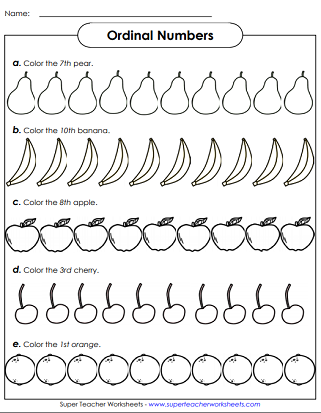 Ordinal numbers are users to describe order, or position in a series. Examples of ordinal numbers include, 1st, 2nd, 3rd, 4th, and so on. Students cut out the picture strips with ordinal numbers on them. Sort them from the smallest (1st) to the largest (10th) to assemble a picture of a goldfish. Cut out the ordinal number puzzle strips. 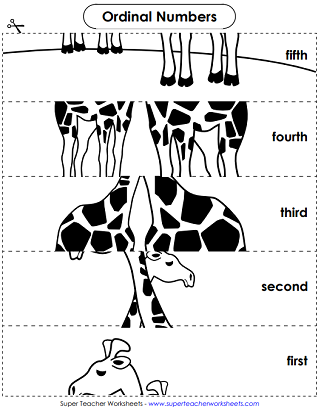 Sort them from the smallest (1st) to the largest (5th) to assemble a picture of two giraffes. Write each month as an ordinal number. Students are lining up to have their pictures taken. Write an ordinal number to correctly describe the order of the students. Write the missing ordinal numbers on the number line. Range from 1st through 20th. 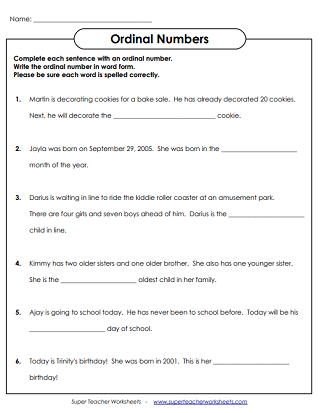 Complete each sentence with an ordinal number. Write the missing ordinal numbers on the balloons. Range from 1st through 24th. Write the missing ordinal number on each penguin's belly. Range from 1st through 75th. Ordinal numbers are also used when reading calendars.